These performances are my absolute favorite! For 20 years I have been performing at school assemblies and have return engagements for more than a decade. 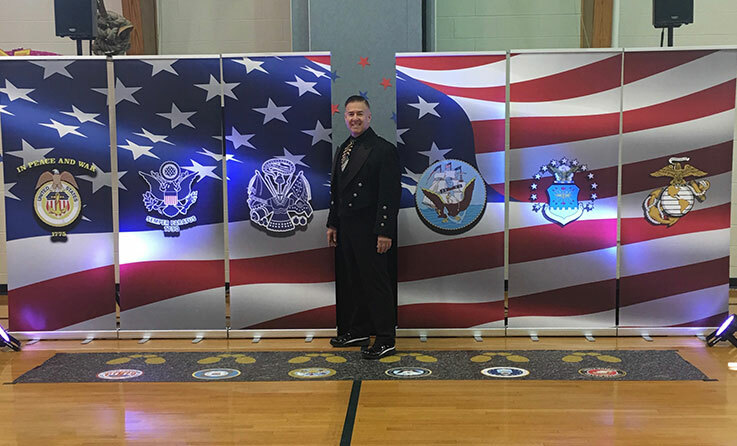 Many schools already have a set assembly for their Veterans/Memorial Day Celebrations that I become a part of by 'weaving' my performance and incorporating my portion as part of their program. I work very closely with the Principal, Music teacher, and all of the other teachers and staff involved to create their tribute. The other assembly is the type where I come in and create the entire show for the school while still working closely with the Principal and Staff. Most people are shocked that the students remain focused an engaged for the entire hour. I incorporate the students in this very interactive and learning rich environment. If you have ever wanted to create a Veteran's/Memorial Assembly for your school please contact me. I guarantee a wonderful experience for all those that attend, in addition to any of the parents or veterans you may invite from the community! Some of these schools include: Paul Revere, Esten, Eastham, Joshua Eaton, and AC Whelan to name a few.